"PNAS" redirects here. For PNAs, the plural, see PNA (disambiguation). For PNaS, Phosphate-Sodium Symporter, see Sodium/phosphate cotransporter. "Proceedings of the National Academy of Sciences" redirects here. For Indian journal, see Proceedings of the National Academy of Sciences, India. Proc. Natl. Acad. Sci. U.S.A. Proceedings of the National Academy of Sciences of the United States of America (often abbreviated PNAS or PNAS USA) is a peer-reviewed multidisciplinary scientific journal. It is the official journal of the National Academy of Sciences, published since 1915, and publishes original research, scientific reviews, commentaries, and letters. According to Journal Citation Reports, the journal has a 2017 impact factor of 9.504. PNAS is the second most cited scientific journal, with more than 1.9 million cumulative citations from 2008-2018. In the lay press, PNAS has been described variously as "prestigious", "sedate", "renowned", and "high impact". PNAS is a delayed open access journal, with an embargo period of 6 months that can be bypassed for an author fee (hybrid open access). Since September 2017, open access articles are published under a Creative Commons license. 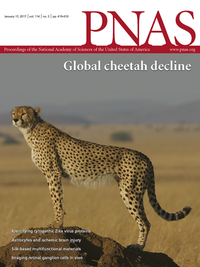 Since January 2019, PNAS is online-only, although print issues are available on-demand. PNAS was established by the National Academy of Sciences (NAS) in 1914,[nt 1]:30 with its first issue published in 1915. The NAS itself had been founded in 1863 as a private institution, but chartered by the United States Congress, with the goal to "investigate, examine, experiment, and report upon any subject of science or art". Prior to the inception of PNAS, the National Academy of Sciences published three volumes of organizational transactions, consisting mostly of minutes of meetings and annual reports. For much of the journal's history, PNAS published brief first announcements of Academy members' and associates' contributions to research. In December 1995, PNAS opened submissions to all authors without first needing to be sponsored by an NAS member. Members were allowed to communicate up to 2 papers from non-members to PNAS every year. The review process for these papers was anonymous in that the identities of the referees were not revealed to the authors. Referees were selected by the NAS member. PNAS eliminated communicated submissions through NAS members as of July 1, 2010[update], while continuing to make the final decision on all PNAS papers. In 2003, PNAS issued an editorial stating its policy on publication of sensitive material in the life sciences. PNAS stated that it would "continue to monitor submitted papers for material that may be deemed inappropriate and that could, if published, compromise the public welfare." This statement was in keeping with the efforts of several other journals. In 2005 PNAS published an article titled "Analyzing a bioterror attack on the food supply: The case of botulinum toxin in milk", despite objections raised by the U.S. Department of Health and Human Services. The paper was published with a commentary by the president of the Academy at the time, Bruce Alberts, titled "Modeling attacks on the food supply". 1980–1984: Daniel E. Koshland, Jr. The first managing editor of the journal was mathematician Edwin Bidwell Wilson. ^ The Stankus book reference states 1918 as the year instead of 1914. ^ "Journal Citation Reports". Clarivate. Retrieved January 31, 2019. ^ "InCites [v2.54] - Sign In". error.incites.thomsonreuters.com. Archived from the original on January 8, 2019. Retrieved January 31, 2019. ^ "Discovery (could pave way for better diabetes treatments)". The News-Star. 86 (264). Monroe, Louisiana. July 6, 2015. p. 2D – via Newspapers.com. ^ "Ben-Gurion study highlights gene that could lead to new therapies for ALS". South Florida Sun Sentinel. September 21, 2016. p. A52 – via Newspapers.com. ^ Lear, John (August 11, 1986). "On Our Knees". The Gettysburg Times. Gettysburg, Pennsylvania. p. 4 – via Newspapers.com. ^ Byerman, Mikalee (October 26, 2008). "Survival skills". Living Green. Reno Gazette-Journal. 27 (300). Reno, Nevada. p. 7 – via Newspapers.com. ^ "U of U programs frequently cited as references". School News. The Daily Spectrum. 27 (167). St. George, Utah. August 16, 1993. p. B2 – via Newspapers.com. ^ "Assistant professor's research gets published". Poughkeepsie Journal. Poughkeepsie, New York. October 13, 2009. p. 1D – via Newspapers.com. ^ Schekman, R. (2007). "Introducing Feature Articles in PNAS" (PDF). Proceedings of the National Academy of Science. 104 (16): 6495. Bibcode:2007PNAS..104.6495S. doi:10.1073/pnas.0702818104. ^ Alan Fersht (May 3, 2005). "Editorial: How and why to publish in PNAS". Proceedings of the National Academy of Sciences. 102 (18): 6241–6242. doi:10.1073/pnas.0502713102. PMC 1088396. PMID 16576766. ^ Garfield, Eugene (September 7, 1987). "Classic Papers from the Proceedings of the National Academy of Sciences" (PDF). Essays of an Information Scientist. 10 (36): 247. Retrieved September 28, 2007. ^ Schekman, Randy (2009). "PNAS will eliminate Communicated submissions in July 2010". Proceedings of the National Academy of Sciences. 106 (37): 15518. Bibcode:2009PNAS..10615518S. doi:10.1073/pnas.0909515106. PMC 2747149. ^ Cozzarelli, Nicholas R. (2003). "PNAS policy on publication of sensitive material in the life sciences". Proceedings of the National Academy of Sciences. 100 (4): 1463. Bibcode:2003PNAS..100.1463C. doi:10.1073/pnas.0630514100. PMC 149849. PMID 12590130. ^ Harmon, Amy (February 16, 2003). "Journal Editors to Consider U.S. Security in Publishing". Archives. The New York Times. ^ Fauber, John (February 16, 2003). "Science articles to be censored in terror fight". Milwaukee Journal Sentinel. ^ Wein, L. M. (2005). "Analyzing a bioterror attack on the food supply: The case of botulinum toxin in milk". Proceedings of the National Academy of Sciences. 102 (28): 9984–9989. Bibcode:2005PNAS..102.9984W. doi:10.1073/pnas.0408526102. PMC 1161865. PMID 15985558. ^ "Provocative report on bioterror online". The Atlanta Journal-Constitution. June 29, 2005. ^ Alberts, B. (2005). "Modeling attacks on the food supply". Proceedings of the National Academy of Sciences. 102 (28): 9737–9738. Bibcode:2005PNAS..102.9737A. doi:10.1073/pnas.0504944102. PMC 1175018. PMID 15985557. ^ Sinsheimer, Robert L. (August 29, 1976). "'Caution May Be an Essential Scientific Virtue'". Los Angeles Times. XCV (270). p. IV:5 – via Newspapers.com. Robert L. Sinsheimer is head of Caltech's biology division and chairman of the editorial board of Proceedings of the National Academy of Sciences. This page was last edited on 18 April 2019, at 02:27 (UTC).